As today is my birthday, I’ll be doing a little bit of celebrating. What better excuse to get my party glam on? If you’re a regular follower of this blog, you’ll know it’s all about the lashes and lips for the quintessential Beauty Passionista look, so these two little beauties are without question part of the regime for getting my glam on! As you no doubt know, I’ve been a busy bee on my #ALipADay series, (which you can read about HERE-LINK! ), so making sure my lips are in great condition is imperative, especially for those close-up shots. No place for flaky lips here! I’ve been using all sorts of lip balms and conditioners, and I’ll be writing about my faves very soon. You’ll also know that I’m a bit of a high-end girl – there’s not a whole load of budget buys on my dressing table. So when these two lovelies landed through my post-box from a brand I was not familiar with at all, I was very intrigued. I started using this lip plumper, Lip Voltage*, a few days ago and although it is primarily meant to plump the lips to make them appear fuller and more “cushioned” I was really pleasantly surprised how moisturised and conditioned my lips felt. Quite often, these plumpers have a habit of leaving my lips feeling parched, but not this one. This is a new peptide and collagen nano (i.e. more easily absorbed) lip plumping treatment that not only does what it says on the tin, but can also resurrect injectable fillers. I can’t attest to this claim as I don’t have fillers, but I can honestly see and definitely feel the difference when I apply it to my lips. There’s no nasty uncomfortable tingle, but I can definitely feel plumper lips, especially when I press my lips together. 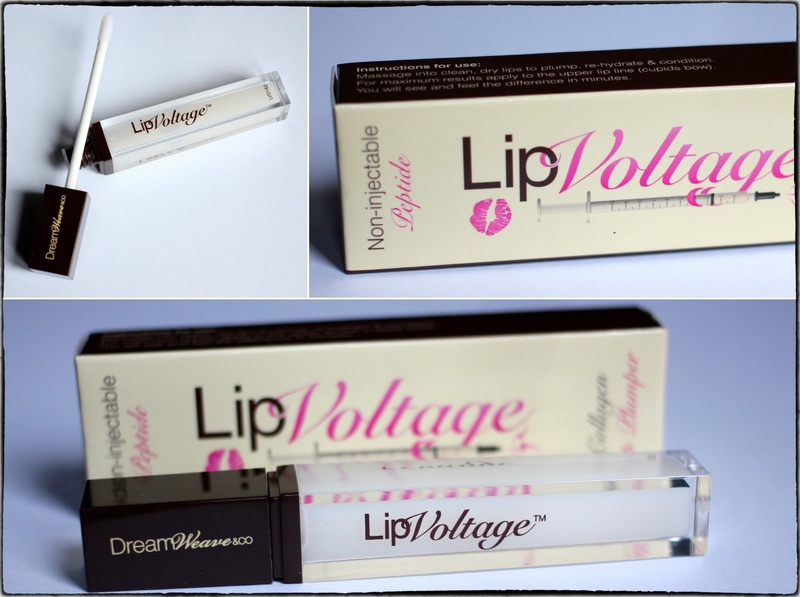 It’s not overly glossy, not sticky or tacky and its clear formulation is comfortable enough to wear on its own or with lipstick. Love this! 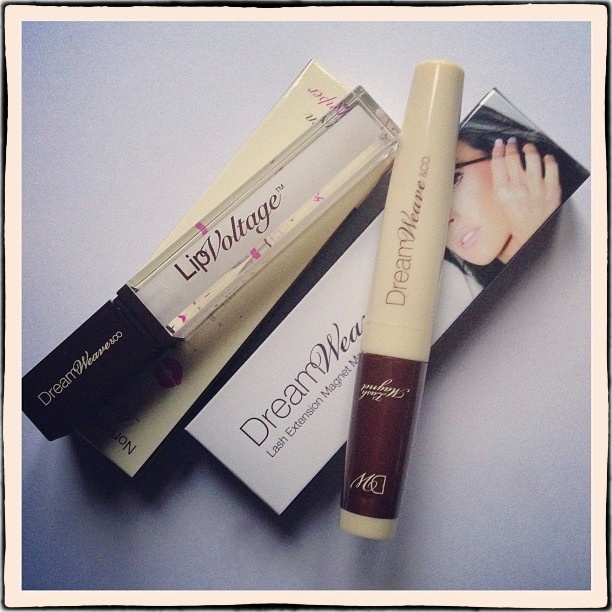 What I love even more from the same company is the Dreamweave Mascara*. Dubbed eyelash extensions in a tube, I have to say I was more than a little sceptical before I tried it. They say the silicone fibrous formula wraps each lash with a ‘fibrewrap’ rather than coating the lashes like a conventional mascara, to give dramatically longer and smudge free lashes. After having tried it a few times, I have to say, it more than lives up to its claims. Now, I already have long lashes, and am regularly asked if my lashes are ‘real’ when I’m wearing just one coat of mascara. Wearing DreamWeave has just taken them to another level, and how! It’s curled and lengthened my lashes in just one coat to the extent that they touch my eyebrows when I look up and with two coats – well, wow! All without clumping or any fibres flaking off onto the cheeks halfway through, or even at the end of, the day. My lashes stayed flexible too, no hard, crunchy lashes that you can’t touch (I’m a terrible eye-toucher!). I’m not normally a lower-lash-mascara person, but I’ve worn this bad boy with abandon on my lower lashes with no problems or dark panda-eyes as a result. The packaging may not live up to my regular high-end expectations, but don’t let that put you off. This really is the bees knees in mascaras – it’ll give you that doe-eyed dolly-lash look. I didn’t find it hugely thickening or volumising but the intense blackness made up for that. And there’s no rubbing to remove this wonder. A regular cleanser does the trick just fine. (Just in case you needed to know, this isn’t paraben free). Oh and the hair! As I’ll be doing my hair myself (no time for a hair appointment, far too many social engagements to fit into one day get myself to the salon! ), I’ll be indulging myself in some of the very best haircare products to treat my barnet. 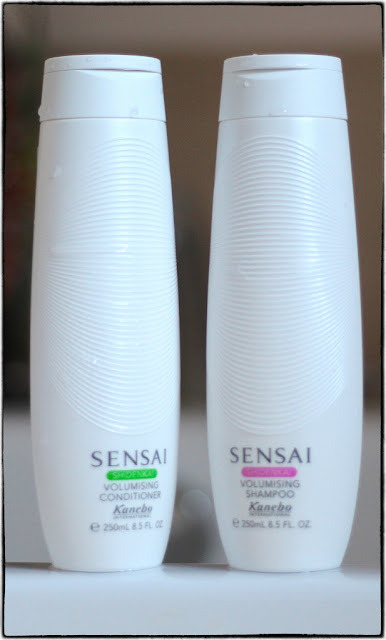 When I’m looking for the very best in cleansing, both skin and hair, I’ll quite often look to the Japanese brands. Japanese women are so very exacting on even the very minute detail so I know that the Sensai by Kanebo Volumising Shampoo and Conditioner* will deliver on all counts. I’ll write a separate review on these soon, as this post is getting far too long, and I need to run to my first birthday outing of the day! Happy Birthday! Where are you of too all glamed up? I look forward to reading about your balm trials. I’m having a hell of a time keep my puckers moisturizer. I’m drinking a much water as I possibly can, but breastfeeding is trying me out, I need some extra help.